I first tried making kale chips a few weeks ago with high hopes. 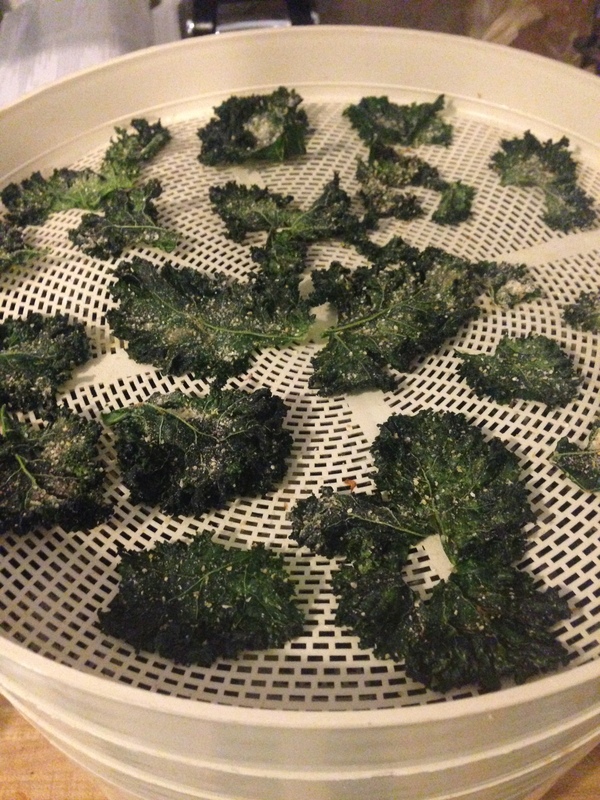 I lovingly removed the stems and broke the kale into chip-sized pieces, lightly dressed them in homemade flavored olive oil and salt, and hovered over them in the dehydrator until they were done. And after all that hope and preparation, they tasted like seaweed! What a let down that was. I figured that maybe kale chips and I just weren’t meant to be together, but then I had an epiphany. I needed some onion powder for a recipe, but I didn’t have any, so I put some dehydrated onion into my spice grinder and realized that it tastes just like the delicious goodness on sour cream and onion potato chips. It was then I knew that I had to try kale chips again, only now with this new flavor explosion. The onion flavor made all the difference, and now kale chips are something that I would choose to eat instead of feeling like I had to eat them so they wouldn’t go to waste. Sometimes I just need to eat something crunchy and savory as a pre-bedtime snack, and these fit the bill. 2-3 T. Onion powder – homemade or commercially prepared. I think you’ll get a more powdery texture if you make your own in a spice grinder. Prepare your dehydrator. If you don’t have a dehydrator, you can use wire racks on baking pans in your oven on the warm setting, or as low as you can make it go. My dehydrator has two settings, on and off. If your dehydrator has multiple temperatures, I would use whatever setting you’d use to dry herbs. Wash and dry your kale, and using a sharp knife, remove the heavy center rib from each leaf. Break the leafy portion into chip sizes. Bigger is better. Little pieces are a pain to handle. Put the kale pieces in a large bowl, and drizzle with olive oil. Toss the leaves, and the drizzle a little more oil until all the leaves are lightly coated. I actually used two identically sized bowls, put one on top of the other, and held them tight while shaking them up and down. Sprinkle with salt, toss or shake the leaves, then sprinkle with some more salt and repeat. Taste a leaf for saltiness. Place the leaves evenly in your dehydrator (or wire racks), putting them right next to each other with no space. They shrink quickly, so there will be plenty of space in about half an hour. Put your onion powder gently into a wire mesh strainer. I rested my strainer over a plate so that if any fell through, it wouldn’t get all over. Gently tap the strainer over each tray of chips, like you’re sprinkling powdered sugar over a cake. Try to keep it even and not too heavy. The oil on the chips will make it stick. You will probably have more chips than you can fit in your dehydrator. If you let the kale dry for about half an hour, the chips will dry and shrink enough for you to rearrange the pieces to fit all the excess. Dry the chips for 6-8 hours. You can put them on right before bed and they’ll be ready in the morning, or put them on to dry in the morning and they’ll be ready for evening snacking. Store them in an airtight container or bag, but allow them to cool to room temperature before you seal them in. I’ve never kept any long enough to have them go stale, but I’d estimate that you should try eating them within two weeks.